The undergraduate major in Public Health Sciences is proud to have alumni throughout the world who share a commitment to improving the public’s health and wellbeing. Many alumni remain involved in the undergraduate program's activities, providing guest lectures in classes, participating in our alumni events, supervising student field experiences, and by serving as mentors for our students. In addition, our alumni are making a difference by giving to Public Health Sciences and supporting our students and educational mission, our faculty and research efforts, and our outreach activities. We are grateful to our alumni and friends for their continuing support. You can read about some of the experiences of our recent alumni below. Lia Delaney ’15 recently graduated from the School of Public Health and Health Sciences with a Bachelor’s degree in Public Health Sciences on the pre-med track with a minor in biology. Since graduating from UMass Amherst, Lia has been working as a research assistant project manager for an environmental epidemiology lab at the University of Michigan. Meredith Willis and Aniko Haber, both ’16, recently completed their final semesters as Public Health majors and Public Health Peer Advisors. We recently spoke with Public Health Sciences alumna Lia Delaney, ’15, who was excited to share with us details of her work in the Public Health field following her graduation from UMass Amherst last spring. After first enrolling at UMass Amherst as a biology major, Lia realized her passion was human health, and more specifically, how the environment plays a role in it. She soon realized that she wanted to know how human populations, rather than individuals, are affected and switched her major to public health. She explained that the classes she took at UMass Amherst and the content from these classes really gave her a strong background to conduct public health research. From these different classes within the major, she learned how to approach a problem or question and how to turn a question into an articulate research question that can be answered. Lia’s primary interest is in environmental exposures and how they relate to women’s health. During her junior year, she started emailing lab supervisors who worked on this specific problem and talked to them about her interests. She was assisted in this endeavor by her research mentor at UMass, who helped her prepare for this next step, and facilitated her introduction to many of these connections. At a research conference, Lia met the Principle Investigator of her current position with an environmental epidemiology lab at the University of Michigan. Originally, he told her that he only hired graduate students, but Lia was persistent and emailed him regularly during her senior year asking him if there were any other similar openings or if he knew anyone looking for a potential candidate. He ended up hiring Lia as a research assistant project manager, which she was thrilled about. Lia’s responsibilities in the epidemiology lab do not include all wet lab work. She is responsible for sample management and project management, as well as organizing several studies. She also organizes shipment samples to and from international field sites and processes them, and will facilitate analysis. In addition, Lia is a main liaison for one of the lab’s larger women’s health studies, based in Puerto Rico. Lia had to be self sufficient from the beginning and be able to shift gears quickly because her role has many different responsibilities. However, after 10 months in this role she realizes how rewarding it has been to see how well things have worked out and to be able to look at these systems that she has created. From her current job, Lia has learned how truly multifaceted the approach to a public health problem is and she has some great advice for students who are looking to pursue similar positions. She advises students to find an interest or question that they want to know more about and then try to find people or opportunities that are pursuing the answer. “Whether the opportunity is an immediate fit or not, you will learn something from it, and it will provide you a direction for the next step, whether or not it is following that path,” she advises. Lia adds that her most significant experience at UMass Amherst was joining a lab, which introduced her to the research and environmental effects on human health. That lab is what sparked her interest in what she does today. She was involved with this all four years at UMass and believes she would not be where she is today without it. Lastly, Lia was excited to share with us that she will be applying to medical school for Fall 2017, so we wish Lia the best of luck! Kelsey Jordan ’14 graduated from UMass Amherst with a dual degree in Public Health Sciences on the social science track and Women, Gender, and Sexuality Studies with a minor in Spanish, and a Culture, Health and Science Certificate. Since graduating from UMass Amherst, Kelsey has been working as a Health Education Specialist at CommunicateHealth. Meredith Willis and Aniko Haber, both ’16, recently completed their final semesters as Public Health majors and Public Health Peer Advisors. We recently spoke with Public Health Sciences alumna Kelsey Jordan, ‘14, who was excited to share with us details of her work at CommunicateHealth following her graduation from UMass Amherst in May 2014. While enrolled at UMass, Kelsey changed her major several times, but finally landed on public health because of her fascination with how our identities, access to resources, culture, and values impact individual and community health. Kelsey mentioned that the School of Public Health and Health Sciences does a great job introducing students to the breadth of the field. When Kelsey was a junior at UMass, she began volunteering at CommunicateHealth, a health education and communication business specializing in improving health literacy. She assisted the team with plain language writing, formative research, project coordinating and began exploring the field of health literacy. Her volunteer opportunity turned into an internship for college credit, then a part-time job, and eventually a full-time position. Now, Kelsey is a Health Education Specialist at CommunicateHealth and helps her clients better communicate their health information to their target audience. In addition to working at CommunicateHealth, Kelsey also works as a postpartum doula providing support to families following childbirth. CommunicateHealth’s mission is to empower people with clear and accessible health information. Kelsey’s day-to-day responsibilities at CommunicateHealth include coordinating formative research like focus groups and in-depth interviews, thinking through content strategy, improving website usability, and working with the CommunicateHealth team to help clients create and disseminate health information that resonates with their target audience. Kelsey works for federal, state, and local clients. Her favorite project so far while working at CommunicateHealth was writing an arts integrated self-advocacy health curriculum, which she co-taught with a local teaching artist. The curriculum combined theatre and health education to teach adults with limited literacy skills how to advocate for themselves in health settings. Kelsey heard about CommunicateHealth at one of the public health internship fairs during her junior year. At the internship fair, she talked to a CommunicateHealth staff member and reached out to the company to ask about volunteer opportunities the next day. Following this, she was able to schedule an informational interview with another member of the CommunicateHealth team, which led to her volunteer position with the organization. When discussing challenges, Kelsey described them only as positive ones. She thrives in an environment where she always has to learn different skills and her job challenges her in that way. She explained how her colleagues always encourage her to develop her skillsets. Another challenge Kelsey faces is knowing and understanding the scope of her work. The challenge there, she quoted, is that “you can’t change the whole world, but you can certainly make it a lot better.” She continued to tell us that knowing the scope of your impact and then running with that is challenging in public health because we all want to make a difference. Learning to see the weight of small changes is both challenging and rewarding. Kelsey learns a lot about public health from her current job. She is learning how public health activities operate in a variety of settings and what public health means to all different kinds of people. She explained how multifaceted the field is, and when you see it in action, the breadth is enormous. She also observes the barriers that organizations can experience trying to implement best practices in health communication and health education. She continued to say that strategic thinking and creativity go a long way in her work. Being innovative and creative are valuable skills in the public health field in addition to knowing the books. Kelsey has great advice for students who are exploring internship or employment opportunities. As a big advocate for taking advantage of all kinds of different experiences, she encourages students to make connections between their lived experiences and professional goals. She also advises students to meet people who are successful in their field and have an informational interview with them. She talked about how this relates to interpersonal skills and job interview skills because it is important to be thoughtful and come across as someone you would want to work with. Thus, informational interviews are a great way to practice this. Kelsey went on to say that there are most likely going to be other people in any room that love and share the same passion you do, so don’t be afraid to put your foot forward. Kelsey had an incredible experience at UMass Amherst and loved every minute of her time as a student here. Her absolute favorite memory was making all her new friends during her freshman year in Van Meter. She enjoyed attending the hockey games, sitting in the campus center or the library doing homework, and studying at Rao’s Coffee. Everyday at UMass was different for Kelsey and she loved the excitement of that. In addition, she performed in the Not Ready for Bedtime Players at freshman orientation, which she really loved. Furthermore, Kelsey worked in the International Programs Office as a study abroad peer advisor after studying abroad herself in Granada, Spain. For today’s public health students, Kelsey recommends exposing yourself to different parts of the field. She also says to just have fun and enjoy your college experience. She says if you are passionate about public health, it does not need to be limited to your full-time job; you can make it as much a part of your life as you want it to be. For example, Kelsey adds that she recently became a Zumba instructor. One of her core values that makes her so invested in public health is women’s empowerment and body positivity, so becoming a Zumba instructor has been a great way to build and expand on this value. She loves how fun and empowering it is. Lastly, Kelsey adds that she is always happy to be a resource for students to talk about their interests or professional goals! Sonia Filipczak ’14 recently graduated from the School of Public Health and Health Sciences with a Bachelor’s degree in Public Health Sciences and a minor in biology. Since graduating from UMass Amherst, Sonia has been working as the Director of Community Health Outreach at the Railroad Street Youth Project. Aniko Haber and Meredith Willis, both ’16, recently completed their final semesters as Public Health majors and Public Health Peer Advisors. We were so excited to chat with Sonia Filipczak and hear all about her current experiences in her role as Director of Community Health Outreach at the Railroad Street Youth Project and also reflect on her memories while enrolled at UMass Amherst. Sonia initially started at UMass as a transfer Biology major from a community college in her native New Jersey. During her second semester of her junior year, at which time transfer students must have declared their majors, Sonia saw an advertisement for becoming a peer health educator. She wanted to find out more, which is how she discovered the Public Health major. Sonia realized this is what she wanted to do, so she switched to public health on the science track with a collateral field in biology. Sonia said it was such a great experience to be involved in public health because it is much smaller compared to other schools on campus, giving it a great community feel. Sonia says that the classes in the Public Health major were small, very thorough, and allowed her to be able to work closely with her professors, which was different from her experience as a biology major. Public Health was able to point her in right direction. Sonia always really loved science and found that public health is a means to apply science to the real world. When Sonia sat in on an “Intro to Public Health” class, she noticed the passion involved and realized that she could take the information and work in the community to actually make a difference. Sonia says that "public health is everything around us, which is most important when trying to change the world." Currently, Sonia works as the director of youth and community health outreach in Berkshire County for the Railroad Street Youth Project. She is the coordinator for all of south Berkshire county for substance abuse where opioid usage is high in the youth populations. The Railroad Street Youth Project is a youth-centered program aimed at removing the generational gap. About twenty years ago, there was a death by substance abuse and the youths came to the town hall meeting and said that they weren’t able to express themselves in what was going on. This began the Railroad Street Youth Project. Something unique about this nonprofit is that it has a youth board, which is awarded $10,000 every fiscal year to lead their own projects and make their own proposals, enabling them to get their say out to the community. Sonia is hard at work developing a five-year strategic plan centered around how they will combat overdose and substance abuse issues in youth populations. One step in this direction was the formation of the World Café Forum, where the community can come together to talk about tough topics without pressure. The most recent topic this forum tackled was, “What do people in the community do that sends a message that drugs and drinking are okay?” In this setting, youth and the members of the surrounding communities can provide Sonia’s organization with judgement-free feedback. Recently, Sonia has been examining data showing that substance abuse starts with alcohol consumption at a younger age. Now, she is developing an intervention strategy aimed at reducing drinking and substance abuse. Sonia will continue doing outreach and in the next month will undergo training to become a substance abuse counselor and finally have the opportunity to work with the youths one-on-one. Sonia was able to find her current position through the help of her undergraduate program advisor, Megan Griffin. Initially, she only went to Megan for advice on class scheduling but Sonia found the Railroad Street Youth Project job posting through a message from Megan. Sonia was skeptical about applying because she thought she was not experienced enough, but still believed she may have a chance, so she went for it. Luckily for Sonia, the executive director of the organization is a UMass Amherst alumna who worked with the center for health promotion, so she knew about the experience Sonia was getting as a peer health educator. Sonia says her greatest challenge in her current position is that she had to hit the ground running. It has also been a challenge to work her way into the community because it is very small and many of the people residing there have lived there their whole lives. Sonia has had to gain people's trust and let them know that she is there to help. She's also had to adjust to working with youths because they question her: “Why do you care about us? What are you really trying to do?” Thus, it is important for Sonia to keep a positive attitude and use her skills that she acquired at UMass Amherst. What Sonia has learned about the field of public health from her current position is just how important it is to take a statistics course during your undergraduate career! She has had lots of statistical data to look over and process, so having a background in statistics has been crucial. In the field of public health you must be able to understand how the data works and how to interpret it. Sonia also cited motivational interviewing and active listening as important factors in succeeding in her job. Additional advice that Sonia has for today’s public health students is to never sell yourself short. Sonia uses herself as an example because when she first saw this job posting, she did not think she would be able to get a director position. Sonia definitely recommends to just keep firing out those emails! When we asked Sonia what her most memorable moment at UMass Amherst was, she said that there were too many. However, she says her most memorable experience was finding the public health program because there was passion in the program and she could feel the need and desire to help others. Through public health, she felt that she had a purpose. The SPHHS was a much smaller home and most of the professors were very friendly and willing to help, which she appreciated, especially as a transfer student. In particular, Sonia wanted to mention microbiology faculty member Jeffrey Blanchard, who was her first mentor at UMass Amherst. Dr. Blanchard was very supportive and one of the first people to introduce her to lab work, and helped her on her way toward a career in public health. Sonia says that if anyone is interested in applying to the Railroad Street Youth Project, the organization is currently looking to fill two positions. She recommends checking out the Railroad Street Youth Project website, where positions are posted. If anyone is interested in working with youths and substance abuse, they should definitely apply! Mary Ann Petti, ’12, earned her MPH degree from the School of Public Health and Health Sciences. She currently works as a User Experience Specialist at CommunicateHealth, a Northampton-based health education and communication firm specializing in improving health literacy through user-centered design, policy, research, and content development. Alexandria McGowan, ’14, recently graduated with a Bachelor’s degree in Public Health and worked as a Public Health Peer Advisor during her senior year. Mary Ann Petti graduated from UMass Amherst in 2009 with a Bachelor’s degree in Communication. Spurred by her interest in using the power of technology to improve health and wellness, she returned for her Master of Public Health (MPH) degree. In 2012, Mary Ann obtained her MPH in Community Health Education. While a graduate student in the School of Public Health and Health Sciences, Mary Ann completed her practicum in Novgorod, Russia, which turned out to be one of her more memorable public health experiences. She and her fellow graduate students in the Russian exchange program wrote and hoped to implement a social marketing campaign, which proved to be a difficult but important learning experience. The group conducted qualitative interviews to understand the community’s attitudes toward drinking, alcohol, and substance laws and learned that the program administrators were not able to implement a harm reduction campaign as the UMass students had hoped. In the end, and despite the project’s many challenges, Mary Ann feels that they all benefited from the interchange of ideas and public health knowledge. During her graduate studies, Mary Ann researched CommunicateHealth, a Northampton-based health education and communication firm, as a potential place to conduct an independent study program. The company, which specializes in improving health literacy and disseminating health-related information, united both of her interests, communication and public health. It turned out to be a perfect match, and worked out so well that she was offered a job as a User Experience Specialist after graduation. Working at CommunicateHealth has led Mary Ann to become a passionate advocate for the users of a website or tool. She prioritizes the user first when thinking about a campaign or writing copy for a website or other media. She and her team primarily focus on how to make information easier to understand and more accessible for everyone by making design and usability improvements to whatever health product they are working on. She works with web developers and designers, as well as the users, to gain an understanding of how best to improve client websites. Mary Ann attributes her MPH for her ability to understand people’s goals and motivations and also her ability to communicate health-related information to the masses. One of her favorite projects at CommunicateHealth was a mobile app her team built for the Massachusetts Department of Public Health. In the case of a catastrophic event, a Family Assistance Center (FAC) serves as a hub for identifying missing persons. CommunicateHealth designed a mobile app that would help ease communication obstacles between FAC center staff and clients with communication barriers. The app was developed with a user-centered design process, meaning the team made sure users were involved in every step. Images and icons act as visual aids, which eliminate the need for reading and verbal communication. Mary Ann led user research on the project and tested the app with both professionals and people with communication disorders to assess effectiveness. CommunicateHealth recently signed a five-year contract with the Office of Disease Prevention and Health Promotion to provide communication and web support for their initiatives including Healthy People 2020 and healthypeople.gov, healthfinder.gov, health.gov, the Dietary Guidelines for Americans, and the Physical Activity Guidelines. Mary Ann is the task lead for Healthy People 2020 activities and is currently leading redesigns of interactive features across the site, as well as user research across the contract. The company continues to grow at a rapid pace, which presents tremendous opportunities for its employees, but also challenges including a heavy workload. Additionally, Mary Ann encourages students to take initiative and seek out opportunities. “Don’t wait for opportunities to come to you. You have to make them happen for yourself!” she says. Mary Ann is a perfect example of that, having set up her own independent study, and now working at a fast-growing company doing what she loves. Amy O’Regan received her Bachelor’s degree in Public Health Sciences from UMass Amherst in 2012. She serves in Arkansas as a member of the Center for Disease Control and Prevention’s (CDC) Public Health Associate Program. 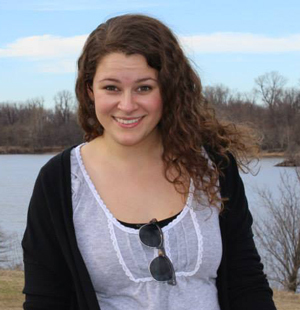 Bridget Aumais, ’15, recently completed her junior year as a Public Health major and Public Health Peer Advisor. Amy O’Regan graduated in 2012 with a Bachelor’s degree in Public Health Sciences from UMass Amherst. While an undergraduate on the science track, she received certificates in Sustainable Food and Farming as well as Civic Engagement, and also participated in the Citizen’s Scholars Program. Amy initially entered UMass Amherst as a pre-med student. While she admired the prestige that comes with being a medical doctor, she didn’t feel like that was a good enough reason to pursue that career goal. Unsure what to do, she arranged a meeting with Lynn Koerbel, the undergraduate public health program advisor at that time. Koerbel had given a compelling presentation about the public health major in one of Amy’s classes. After meeting with Koerbel, she decided to give public health a try. What made her choose public health initially, and then earn her degree in it, was the field’s flexibility; students can pursue coursework ranging from the “hard” sciences to the social science end of the spectrum. Public health workers can deal with any type of disease or injury, and no matter what, they are helping people. Upon graduation, Amy felt unsure what focus she wanted to pursue in public health. Then Lynn Koerbel once again timely intervened, this time with an email with information about the Center for Disease Control’s Public Health Associate Program. The two-year program places fellows with a local health department anywhere in the United States. The fellows work in two different focus areas, one each year, within that health department. Amy applied and was ecstatic when she was accepted into the program. She was placed with the Arkansas Department of Health at a local county health unit. During her first year, she worked with an STD/HIV program as a disease intervention specialist. If anyone in her jurisdiction tested positive for HIV or Syphilis, it was her job to track them down, interview them for the names of their previous sexual partners, and then contact those people for testing and counseling. Now in her second year of the fellowship, Amy finds herself working in environmental health doing everything from soil tests to restaurant inspections to sampling water at a local swimming beach. Her work has provided her with two dramatically different experiences within public health, but the opportunity has given her an incredible amount of hands-on training in the field. Amy believes her UMass education prepared her for her current fellowship in many ways. She would highly recommend the Citizen’s Scholars Program because it was through those courses that she learned a lot about social justice which enriched her public health education. One of the most influential people to her was Gloria DiFulvio, the Public Health Undergraduate Program Director, who taught some of her Citizen’s Scholars courses. She credits Gloria for teaching her how to think outside the box, see different perspectives, and set an example as an effective facilitator. Each day, she tries to bring the same motivation and excitement to her job that she had at the very beginning, because that excitement is what keeps her diligently doing her job and inspiring others that she works with to do the same.